Pain Management in Veterinary Practice provides veterinary practitioners with the information needed to recognize and manage pain in a wide range of large, small, and exotic animal species. Encompassing acute, adaptive, and chronic, maladaptive pain, the book provides an up-to-date review of the physiology and pathophysiology of pain. Pain Management in Veterinary Practice offers specific strategies for addressing pain in animals, including local and regional analgesia, continuous rate infusions, and novel methods of analgesic drug delivery. With comprehensive information on the pharmacokinetic and pharmacodynamic characteristics of analgesic drugs, the book goes beyond pharmaceutical options to incorporate scientific information on techniques for complementary treatment, including physical therapy, acupuncture, chiropractic techniques, and nutritional strategies. 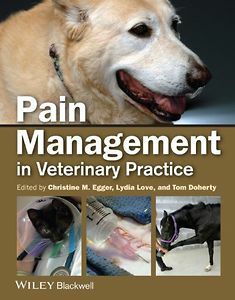 Pain Management in Veterinary Practice is a valuable resource for developing pain management protocols in the veterinary clinic.